Polaiteoir Meiriceánach agus gobharnóir Stát Nua-Eabhrac is ea Andrew Mario Cuomo (a rugadh ar 6 Eanáir 1957 in Queens, Nua-Eabhrac). 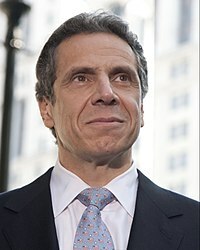 Is é Andrew Cuomo an mac is sine ag Mario Cuomo (a rugadh sa bhliain 1932), a bhí ina ghobharnóir ar Stát Nua-Eabhrac freisin, agus ag Matilda Raffa. Tá dearthóir, Chris, ag Andrew chomh maith le deirfiúr, Maria. D'fhreastail sé ar Archbishop Molloy High School (1975) agus bhain céimeanna amach ó Ollscoil Fordham (1979) agus ó Scoil Dlí Albany (1982). Ón bhliain 1991 go dtí an bhliain 2003 bhí Andrew Cuomo pósta le Kerry Kennedy, iníon le Robert Kennedy agus Ethel Kennedy. Rinne Cuomo agus Kennedy colscaradh. Tá triúr iníonacha acu: Mariah Matilda Kennedy Cuomo (a rugadh sa bhliain 1995), Cara Ethel Kennedy Cuomo (1995) agus Michaela Andrea Cuomo (1997). Aturnae Ginearálta Stát Nua-Eabhrac a bhí in Andrew Cuomo idir na blianta 2006 agus 2010. Tá saineolas aige ar chúrsaí lóistín agus títhíochta, agus d’oibrigh sé i gcoinne an truaillithe pholaitiúil. D’oibrigh sé ar feadh roinnt blianta i rialtas an Uachtarán Bill Clinton mar rúnaí stáit ar son títhíochta. Tá sé mór le Bill Clinton go fóill. Toghadh é mar ghóbhanóir ar Stát Nua-Eabhrac sa bhliain 2010 i gcomharbas ar David Paterson, a bhí sa phost úd i ndiaidh d'Elliot Spitzer, an ghobharnóir roimhe sin, éirí as an phost mar gheall ar scannal faoi striapaigh. Ba bhaill den Pháirtí Daonlathach iad Paterson agus Spitzer, mar i gcéanna le Andrew Cuomo. Tugadh an leathanach seo cothrom le dáta an 31 Lúnasa 2017 ag 20:03.